If you’ve never flown in a helicopter before, you’ll find it an utterly thrilling experience that you’ll want to do over and over. If you’re new to helicopter flight, you will inevitably have questions concerning how we go about it, safety and how to book a helicopter. 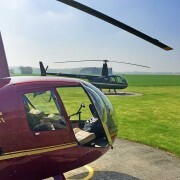 Our helicopter FAQ answers many of the questions often asked and hopefully gives you some information on how to book a helicopter for your personal transport or how to use a helicopter pleasure flight gift certificate. Can the helicopter land anywhere I want it to? 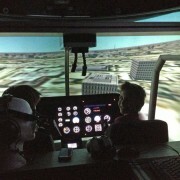 We can land almost anywhere, with some common sense and legal limitations. The CAA is most concerned about safety. They prohibit landing on any area where the landing would represent a “hazard” to persons or property on the ground. However, if you have the property owner’s permission, the area is large enough and unobstructed, and has a clear approach, then we can land almost anywhere. Permission is usually required in writing and some venues, such as sporting events, require special permission. Are there any height or weight limits? 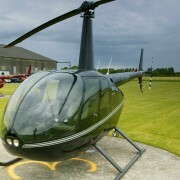 The Robinson R44 four seat helicopter can accommodate quite tall and relatively heavy persons but no heavier than 21 stone (134kg) per seat. For a typical Robinson R44 helicopter flight, the average weight per person for 3 passengers and pilot would be about 14 stone (about 200kg). What happens of the weather is poor? Our pleasure flying days always take place in accordance with safety regulations and as such can sometimes be delayed or cancelled. The day before your flight, it’s important to call our message line on XXXXXXXX and listen to the recorded message for the very latest news. This will help you plan your trip to the airfield and avoid an unnecessary journey if the weather is poor. In the event of cancellation, your voucher is reset and you can call or main line to rebook your flight. It’s about what you are flying over really. Over people & property you should not be any lower than 500 feet. 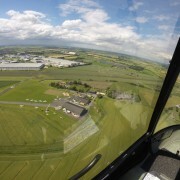 Over a major urban area the basic rule is no lower than 1000 feet but you may need to be higher as the guidance states you need to be able to glide safely to a suitable landing site if the engine fails. 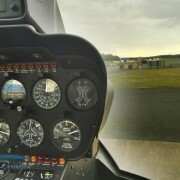 Below 500 feet and it’s more about the safety limitations of the aircraft for other than taking off or landing. We’ll explain all this is accordance with your flight. Are young children allowed on pleasure flights? Generally anyone can be a passenger on a pleasure flight. Young children should be accompanied by an adult.